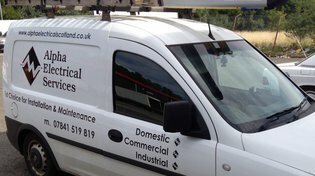 Alpha Electrical Services was founded by Stephen Murphy after 15 years experience as a qualified electrician working in all area's from domestic refits to running major construction sites. Alpha Electrical Services offer a reliable and trustworthy service, whether a major blue chip company requiring a new factory installation to hanging a new light socket in your hallway, Stephen is always available to come and service your electircal needs. Stephen is based in Whitburn, West Lothian, which gives unrivalled direct access to the whole of Scotland's central belt, easily within 35 minutes of major towns & cities. With knowledge & experience of the whole electrical industry, and also fully qualified in all current legislation, Stephen is more than capable of offering reliable advice on whatever your electrical requirement does entail.